(Minghui.org) Residents and visitors to Australia’s tourism capital in Queensland, the Gold Coast, have strongly supported an international legal action to bring former Chinese Communist leader Jiang Zemin to justice for committing crimes against humanity. Supporters held an information day on September 18, 2015, on the busy Cavill Mall in downtown Surfers Paradise. Volunteers and Falun Dafa practitioners held banners displaying messages supporting human dignity and calling for Jiang to be held accountable for his role in the arbitrary detention, torture, organ harvesting, and death of more than 3,858 people who choose to live according to the principles of Truth-Compassion-Forbearance. Many people stopped to read the banners and get more information. A young man visiting from Sydney commented that he frequently saw practitioners in the Chinatown district, handing out information about the practice and the Chinese Communist Party’s (CCP) 16-year-long persecution in China. He said he supports what they are doing. A woman on holiday from Sydney mentioned that her husband closely follows what is happening with Falun Dafa in China. She took a flyer and signed the petition, promising to give the information to her husband. Many people signed the petition asking the Australian Government to support international efforts to bring Jiang to justice. Sometimes whole families would sign after hearing about the terrible suffering Falun Gong practitioners have had to endure in China. Even Chinese tourists were drawn to take the information and sign the petition. Many did so without even saying a word, as if there was no question that Jiang should answer for his crimes. One man said, “Good for you,” when offered an informational flyer. Even Gold Coast City Council staff, who were cleaning the area, stopped for a long time to learn more about the movement to sue Jiang. (Minghui.org) Since its launch in 2004, the annual Ormeau Lions Fair has attracted thousands of people every year and is now the largest community event in the region. Falun Gong practitioners joined the festivities this year, for the third time, on September 5 and 6. Practitioners demonstrate Falun Gong exercises during the Ormeau Lions Fair in Gold Coast, Australia. 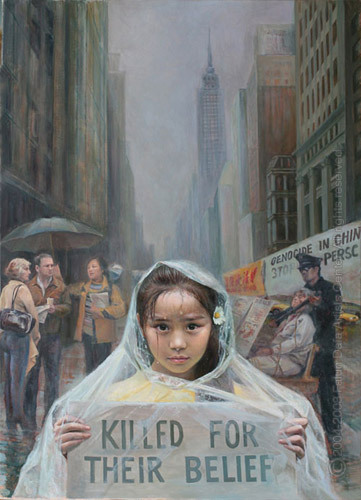 Upon hearing about the severe suppression of Falun Gong in China, a large number of attendees signed petitions calling to stop the brutality. “Harvesting organs from living practitioners? It’s insane, and it must stop,” said John, who came to see the fair. Practitioners give out handmade paper lotus flowers. One woman signs a petition to support practitioners’ peaceful resistance to the suppression by communist authorities in China. Michael, who does martial arts as a hobby, had heard about Falun Gong in the past and how it is persecuted in China. He asked why practitioners would risk their safety and even their lives for a meditation practice. One practitioner told him how the practice changed her to a new person, both physically and mentally. Another practitioner talked about his permanent knee injury, which occurred during wrestling many years earlier. His knee fully recovered after he began to practice Falun Gong.